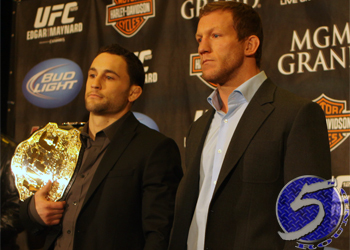 As expected, Frankie Edgar will defend his lightweight title against Gray Maynard at UFC 130. The May 28th pay-per-view broadcast takes place inside the MGM Grand Garden Arena in Las Vegas, Nevada. “The last time Gray and Frankie fought, they put on one of the best fights of the year,” UFC president Dana White said. “It was the draw no one really complained about. I think a lot of people saw in that fight that Frankie Edgar is the real deal. The lightweights kicked off 2011 with a highly controversial draw at UFC 125. Although the Maynard layeth the smacketh down in the 1stRound, Edgar showed the heart of a true champion and managed to survive the onslaught. A couple of hotly contested rounds later, most notably three and five, and both fighters were forced to exit the Octagon in disgust. The bright side for Edgar is that he left Las Vegas with the title in tow. Maynard posted a convincing unanimous decision win over Edgar in their initial meeting back in April 2008. UFC Fight Club members will have the opportunity to purchase seats for the show on Thursday, March 17th at 10AM ET/7AM PT via UFCFightClub.com. A special Internet ticket pre-sale will be available to UFC Newsletter subscribers on Friday, March 18th at 10AM ET/7AM PT. The general public will have access to the remains on Saturday, March 19th at 10AM ET/7AM PT.